We try to keep things simple here in Bertie County. For example, we have only three traffic lights in town, and probably could make do with only one! Another example of keeping things simple was Papa Jack's love of grilled steaks seasoned only with salt and pepper. And, since we like to carry on tradition here at Bertie County Peanuts we thought it might be interesting to try seasoning some of our Blister Fried Peanuts with a mixture of salt and pepper. Well, needless to say, that uncomplicated combination of tastes was a big hit with our local taste testers. And, after a few months of recipe tweaks we are proud to introduce Sea Salt & Black Pepper Peanuts. We think you'll love the simple combination of flavorings. We do! The blister fried are great, but the Sea Salt & Pepper are ABSOLUTELY THE BEST THING EVER !!!!!!! Addictive ! I found this ad during a web search as my cousin and I both loved the runners from a peanut company in Oklahoma that has since closed. I liked them so well, that with my next order I had a jar sent to my cousin in Oklahoma. She loved them and said "looks like Bertie County has my business also". We don't have peanuts like this in California. I sampled the Sea Salt & Black Pepper peanuts, after buying them for my daughter, thinking I wouldn't care much for them. Was I ever wrong! I will have to alternate between these and my favorite Blister Fried. Once you start eating these nuts you can't stop. I had to hide my jar from my husband! We love them!!! We tried these peanuts while visiting family in north carolina, they were the best. we've ordered them on line and will do so again! These peanuts are really different with the sea salt and black pepper combined. They take a little bit to get use to the flavor, but at the same time you keep going back to them. Very addictive!! These nut are great, the seasoning is just right, not to salty or peppery. Owner Response:Great suggestion! We are looking for ways to improve our shipping costs, but we also want to get the product to you as soon as possible. Many of the "cheaper" shipping options promise to deliver within two weeks. We don't like that option, so we'll keep working on the issue. These are the best peanuts I've ever eaten. Can't get enough of them and have to hide the jar from myself. Great product! The best I've had! Good size, perfect crunch, not too salty not too hot, can't stop! Love the Salt & Pepper peanuts. Fresh taste with just the right amount of pepper. Once you try these peanuts, you're spoiled for life. We order them by the case. My favorite! Excellent balance of spices and quality peanuts. A favorite when I serve them. We taste tested these before they were on the market. They are amazing! I love black pepper and with the sea salt and peanuts....HOMERUN!! These black pepper and sea salt peanuts are fantastic. I got a large jar for Christmas from my son. So good, I just ordered 2 more large jars. Outstanding peanuts, always fresh and taste of seasoning perfect. If you like black pepper,you will not be able to stop eating these. Had my first taste of them at a party. The next morning, I immediately ordered 3 jars. My family just LOVES them! These peanuts are simply the best - texture or taste. Don't think I can ever go back to any other brand now! Great taste and peanuts are large. The peanuts are top quality. I love pepper on potato chips so I thought I would like the salt and pepper peanuts. Might be my favorite. Would never have thought to put black pepper on peanuts. These things are so good that we almost can't stop eating them. Great peanuts and great pepper. But pretty salty too. bought a case to take to friends on vacation from Atlanta to the mountains of NC - I'm spreading the word! Doesn't get any better than these! These are the best you'll get. They're the largest peanut I've ever seen. The sea salt and pepper is awesome. Best Peanuts hands down. Their fresh and crunchy with a peppery, salty taste. Delicious. My family loves the sea salt and pepper peanuts - they are a wonderful treat!! I first tasted your product from a sample obtained at the Work Boat Show in New Orleans. I have since ordered some of your products but am turned off by the lack of local retailers and the high cost of shipping. I would purchase a lot more of your peanuts of the overhead was not so high. Owner Response:We agree that the shipping is higher than we would like, and we express our thoughts with the carriers every chance we get. In the meantime, we will investigate to see if there are any retail options within your local area. And, if you have any suggestions, please let us know. The peppered sea salt peanuts are delightful. They have just the right amount of "bite" and are very addictive. Very tasty, just the right amount of salt & pepper! Highly Recommend! Not pleased with the bigger size. Tried the 10oz very impressed they were dry not overly oily, a nice crunch, good fresh aroma/smell, good size peanuts overall great quality! But the 30oz was oily so much so that the salt & pepper stuck to the sides of the container & had a been packages for a while aroma like peanuts get when there old that smell! Due to the increase in oil peanuts were not as crunchy. So if I buy more it will not be the bigger containers ! Will stick with the 10oz size. These were really good. They were salted enough and the black pepper added a little bite, but not too much. THE SALT N PEPPER NUTS ARE ALWAYS A FAVORITE ATE OUR HOUSE. TRIED THE WEEPING MARYS GHOST PEPPERS THIS YEAR CAUSE I LIKE SPICY AND THEY ARE GREAT IF YOU LIKE A KICK! I love every flavor and style; they make great gifts! A plus is that they support the economy in the northeastern counties of NC. This is a different twist and we love them - have been buying them now for a couple years. Just the right seasoning. Doesn't mask the great peanut flavor. These peanuts are seasoned just right. Love them! I bought a small jar of these peanuts at the Southern Christmas Show. My husband said the only problem was the jar was too small. Gave him and my son a large one for Christmas and had to come back for a case. A great treat with delicious peanuts and just the right seasoning. These are now my go-to Bertie County product. Been sharing them with only my best friends. everyone in our family loves these nuts! The first time we ever had these they were given to us as a gift, we thought we wouldn't like them one bit...but we ate 2 or 3 to try them and love them! That's when we placed our order! Your sea salt & black pepper peanuts are a family favorite and one we often gift to friends. Thank you! These nuts are addictive, I order them by the case! Excellent flavor and texture. Nice and crisp. Well done! These are absolutely the very best! Oh man....these are fantastic. Large, quality peanuts with salt AND pepper. Go easy, because once you start....well, you know the rest. Highly recommended. A favorite product that we love to share. 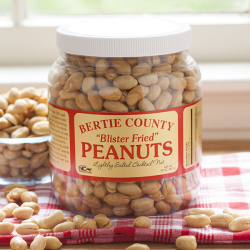 Blister Fried Bertie County Peanuts are great. Add just a bit of spice with black pepper and they become even better -- like addictive! IIf you like the taste of salt and pepper you will like this nut. Had the salt/pepper pnuts at holiday party & ordered some immediately. They arrived amazingly quickly. These are so far above grocery brands in quality & taste! Once again I was surprised in the flavor of the Sea Salt & Pepper peanuts. I was expecting a powerful pepper experience but was amazed how mild it was. Just the right amount of flavor. Way to go! Big and crunchy peanuts with plenty of black pepper and just the right amount of salt. Very good flavor. Fabulous taste and texture. Even my wife who claims not to like peanuts loves them. Just the right amount of salt and black pepper -- not too salty. Ordered two big containers -- will need to reorder soon! Love the sea salt and pepper peanuts. Just the right on the go snack and to put out for a party. These peanuts are nicely salted and peppered. They are not too spicey, but have the right kick. They have been enjoyed by many. 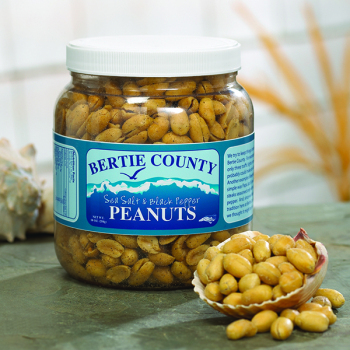 I was in Windsor some years ago, and was introduced to the Bertie County Peanuts and have been ordering them ever since. I also give them for Christmas presents and everyone loves them also. Thank you for a great product. Bertie County Peanuts are the best! My wife and I, both huge foodies, stumbled across the facility a year or so ago and tried these peanuts for the first time. They are now a staple in our house and we have "shared the love" by sending these to family members all across the US! An extra twist to a already great product. The salt and pepper add just a bit of a bite to the great peanut flavor. We received the Salt and Peppered Peanuts a few yrs ago as a gift and Loved them!! We have turned many people on to these, best gift ever and I wasn't even a pepper person. Trader Joes used to have black pepper and sea salt peanuts, which I loved but then they stopped carrying them. I thought that was it for something that I enjoyed until a friend mentioned in passing that they'd found them at Bertie County Peanuts. I tried them and they were better than what I remembered. I'll be ordering them again. I can't wait for some of the seasonal options. My brother shared these with us while we were both in Hilton Head. We loved them and have now ordered our own. Good stuff! We highly recommend this company!! We were given some peanuts from them as a gift from a family member and they were delicious!! We loved them so much that we decided to order some for my father in law as a Father's Day gift. We had an issue with our package that was a result of Fed Ex, not Bertie County Peanuts, and when I contacted Bertie County and explained what had happened with the delivery they immediately sent me out a new jar and even ensured that I received it prior to Father's Day. I truly appreciate their help, I will order from them again and recommend to others! Owner Response:We try! Thanks for the kind comments! Jun 27, 2017 | By Susan C.
Our friends love the Bertie County nuts that we serve at gatherings. So when I order, I get a few extra jars to give away. For barely over $5, this gift is greatly appreciated. 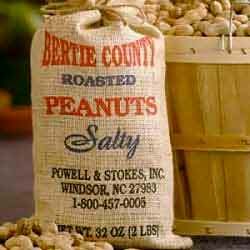 Sea Salt & Pepper are one of 2 favorite Bertie County Peanuts. Great with cold beer! I learned about your products by accident but what a happy accident it has been. A big fan. The salt and pepper peanuts are the best peanuts I have ever had. I gift them quite a bit. Thanks for being so committed to quality! A rate quality in this world. Thoroughly enjoyed my first jar of Bertie County nuts Sea Salt & Pepper seasoned. DEE-lish-iss! Noticeably fresher & crispier than canned nuts, without being at all greasy. Didn't taste the peppery flavor as much as we would have liked too but still VERY good. I don't think pepper clings as well to the nut where salt certainly does. Will definitely order again - yum. Love the Sea Salt and Pepper! Ordered these for my husband because he spoke so highly of them. I tried them, loved them! Perhaps my new favorite peanut in the world! Definitely sending my Dad a jar of these! He will love them! We sent a couple jars to friends of ours in Arkansas as well for Christmas, the husband called saying they were the best peanuts in the world. The peanuts made my husband happy and certainly served as a delightful gift for friends during the holiday season. Very happy with our purchase! Love these peanuts, great service YUM! These are so tasty and stay freaky in the 10 oz jar. We eat them very fast. Love these nuts. Large size and flavored just right. Will continue to order. 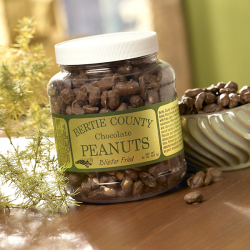 Bertie Co peanuts are so delicious and they make great gifts! All of their selection of peanuts, chocolate covered or seasoned nuts are awesome! Stop by and get you some. We buy them by the case. First enjoyed these in Bluffton, S.C. Once home in Ohio, had to have more. Great snack and good for you,too. Salt and Pepper Peanuts are awesome! These were the best tasting peanuts I have ever had. Very fresh. Very tasty. A great crunch. I will buy the 30 oz jar next time! This may be my new favorite. Long time customers - peanuts are the best year in and year out! I have been a Bertie County peanuts customer for almost 2 years now. Their products are amazing. Esp the salt and pepper peanuts and the raw shelled peanuts. I tried their peanut brittle for the first time and they were delicious. The prices are very affordable and delivery is always on time. Love Bertie county Peanuts!!! We love Bertie's!!! The best service and best product ever!!! The Sea Salt and Black Pepper peanuts are the best ever!! Without intense discipline, you might wind up eating all of them in one sitting! They are that good! Excellent quality. Fresh, tasty snack. Love the salt and pepper. The pepper gives them a distinct taste. Best peanuts I have ever enjoyed. Large size: much better than those found in the grocery. Unique salt and pepper flavor. You can't go wrong trying these! My husband loves peanuts and once we were gifted these at Christmas I know we will never go back to anything else! They stay so crunchy, not soft and oily. We've had sea salt and black pepper, Batchelor Bay, Chocolate covered and Regular and all are fantastic. This made for a great Valentine's gift. 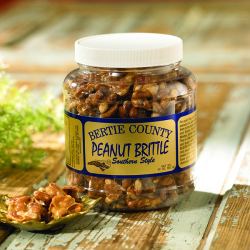 If you like peanuts, you have to try Bertie County. We got your peanuts right here. 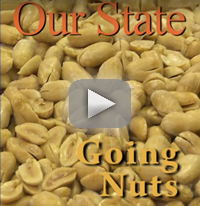 Bertie County has the best peanuts in the Nation. Blister fried, salt and pepper or chocolate dipped and more. They're all good ! BC products are the best! These are great pnuts, but you'll notice I only buy during your annual no shipping charge sale. Your shipping prices for single items are ridiculous. Love these nuts. We have them shipped to Pennsylvania. My clients rave about these. I get to share a taste of NC at a modest cost. Great story of the product's background and the small, stop light town the peanuts are grown in adds to the appeal of the gift.